Lecture Performance mit Jennifer Lyn Morone. Jennifer Lyn Morone gives an overview of the background, development, tactics and contradictions of the data economy in the performance lecture ‘Mine, Mine, Mine!’ The lecture will raise questions about the inherent incompatibility of privacy in an information economy, and offer an alternative approach by challenging the audience’s role in how they may operate in this economy through the re-appropriation of corporate strategy. JLM Inc will be presented as a case study to to provoke and engage in questions of property, value, labour and the possibility of agency to bring about change. 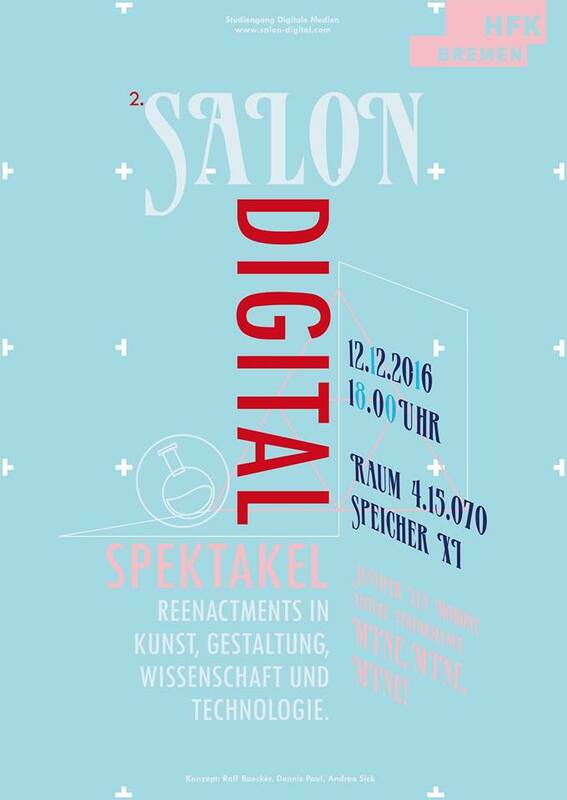 The program for Digital Media at the University of the Arts Bremen is launching a regular series of salon-style gatherings titled “Spectacle: Reenactments in the Arts, Design, Science and Technology.” The events have an open format and provide a forum for experiments, presentations and performances from a range of different fields, but with a common focus on old and new media, as well as technologies. The salon thereby enables a practice of reenactment as a way to make things past and hidden visible, present and also questionable.